Hurricane Willa is a major hurricane threatening western Mexico. Forecasters were able to see the rate of rainfall occurring within the powerful storm when the Global Precipitation Measurement mission or GPM's core satellite passed overhead and provided that data. On Oct. 22, the National Hurricane Center or NHC noted that "Will became a potentially catastrophic category 5 hurricane on the Saffir-Simpson hurricane wind scale and is expected to produce life-threatening storm surge, wind, and rainfall over portions of west-central and southwestern Mexico." Willa formed on Saturday, Oct. 20 and quickly became a tropical storm. 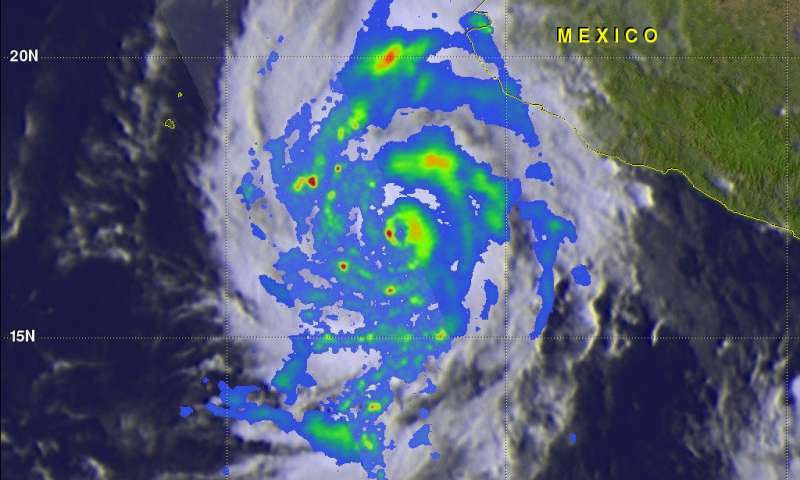 By 5 p.m. EDT, Willa strengthened into a major hurricane and continued to strengthen.Hurricane Willa was a Category 4 hurricane and moving northward toward the western coast of Mexico when the GPM core observatory passed above on October 21, 2018 at 3:51 p.m. EDT (1951 UTC). At that time, the hurricane had maximum sustained winds of about 95 mph (109 knots). 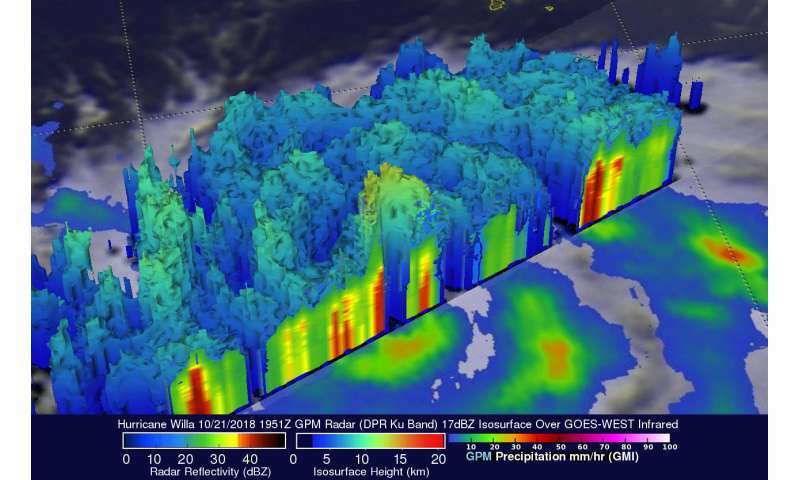 GPM's Microwave Imager (GMI) and Dual-Frequency Precipitation Radar (DPR) instruments collected data showing that hurricane Willa and feeder bands were producing heavy rainfall over a large area. The location of precipitation in Willa's well defined eye wall was made evident by GPM's radar (DPR Ku Band). DPR indicated that a few powerful convective storms within Willa were dropping rain at a rate of over 6.3 inches (160 mm) per hour. At NASA's Goddard Space Flight Center in Greenbelt, Md. a simulated 3-D view was created of the storm looking from the south-southeast reveals hurricane Willa's rainfall structure. It was developed using GPM's radar data (DPR Ku Band). That DPR data enabled a cross-section view that shows the anatomy of precipitation around hurricane Willa's eye. Intense radar echoes of up to 57dBZ are shown (dark red) in this slice through the center of the intensifying hurricane. GPM's radar shows that a few powerful storms in the eye of the hurricane were reaching heights above 8.7 miles (14.0 km). These tall storms referred to as "hot towers" are often an indication of hurricane intensification. These powerful convective storms near the center of the hurricane were releasing energy in the form of latent heat of condensation that powers the hurricane. GPM is a joint mission between NASA and JAXA, the Japan Aerospace Exploration Agency. The National Hurricane Center said "Willa is expected to produce storm total rainfall accumulations of 6 to 12 inches, with local amounts to 18 inches, across portions of western Jalisco, western Nayarit, and southern Sinaloa in Mexico. This rainfall will cause life-threatening flash flooding and landslides. Farther inland, Willa is expected to produce rainfall amount of 2 to 4 inches across portions of Zacateca, Durango, southeast Chihuahua, and Coahuila in Mexico, with local amounts to 6 inches possible. This rainfall could cause life-threatening flash flooding." At 11 a.m. (1500 UTC) on Oct. 22 the center of Hurricane Willa was located near latitude 19.1 degrees north, longitude 107.2 degrees west. About 175 miles (280 km) south-southwest of Las Islas Marias Mexico. Willa is moving toward the north near 7 mph (11 kph), and this general motion is expected to continue today. Satellite data indicate that the maximum sustained winds have increased to near 160 mph (260 kph) with higher gusts. Willa is a category 5 hurricane on the Saffir-Simpson Hurricane Wind Scale. Some strengthening is still possible today. Slight weakening is forecast to begin on Tuesday, but Willa is expected to be an extremely dangerous major hurricane when it reaches the coast of Mexico. Hurricane-force winds extend outward up to 30 miles (45 km) from the center and tropical-storm-force winds extend outward up to 105 miles (165 km). The National Hurricane Center (NHC) predicts Willa to accelerate toward the north-northeast and move over or very near the Islas Marias early Tuesday and make landfall along the southwestern coast of mainland Mexico in the hurricane warning area Tuesday afternoon or evening.